Girls who want to dress as the most talented and enchanting nanny in nanny-history will love wearing the Magical Nanny Girl's Costume. Watch the magic start to happen as soon as she's wearing the most pleasant au-pair costume around. What a sleek storybook governess! The peplum-style jacket jas a single button at the center of the jacket with ruffled sleeve cuffs as a fancy accent, perfectly matching the interior ruffled shirt with a center button. (How polished!) The pencil skirt has a comfortable elastic waistband while the hat completes the ensemble. The hat has an interior wire edge to keep the shape. 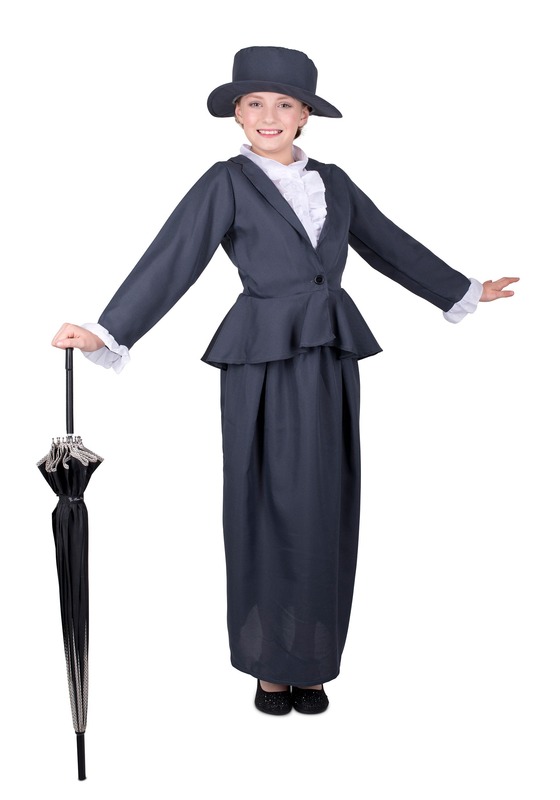 Magical nannies look refined at all times.